Anyone notice the iPhone 5 screen looks darker when off? Discussion in 'iPhone' started by El3ctronics, Sep 6, 2012. 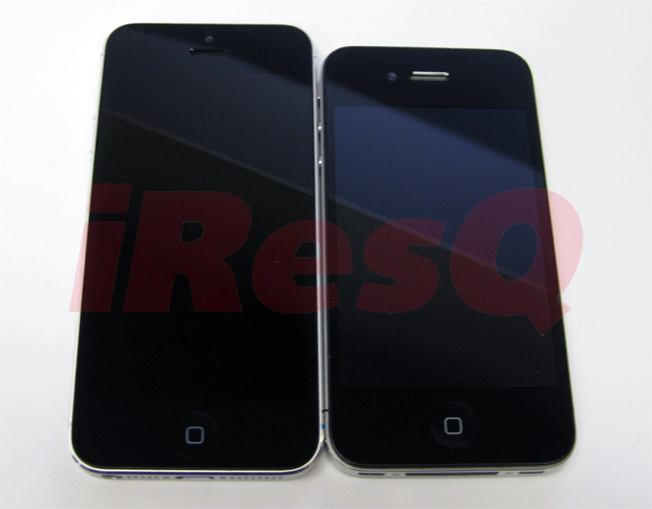 I was looking at some of the leaked images online comparing the iPhone 5 to the 4S and it seemed that when both devices are turned off, the 5 has a noticeably darker screen. Anyone with more technical knowledge than myself know why this would be? Is it a different type of screen being used and would it make the blacks blacker (more similar to an AMOLED screen)? Just found it interesting. OP: Actually hadn't noticed that. Not that I have any real complaints against the current display. Maybe it's a side effect of the new In-cell Display tech? I would def much prefer a screen with more contrast than past iPhone displays so if it leads to more pop in the colors I'd take that as a plus. I'm not sure but I think this is a model not the actual device. I noticed that as well. The glare looks reduced too. Unless the two phones are reflecting light differently. You can actually get the 4S to look pitch black like the iPhone 5 in the photo under certain angle. In-cell display makes the screen blend in with the bezel. Deeper blacks are always welcome! I'm glad the are continuing to improve the screen beyond retina. The weird coloring (I believe) in the 4S is a tiny shadow between the glass touch panel and the display where as in this 6th-generation iPhone the two are literally combined therefor no shadow. Perhaps it's because its a fake? The one in the OP is actually assembled from real iPhone 5 parts, unlike the dummies we saw earlier from case manufacturers. It's mostly a fake iphone people, We'll hopefully see the REAL iphone 5 design the day defore or the day of the conference. We'll see on Sept 12th whether these were real or not. Personally, I think not, and I surely will not be designing anything based solely on "leaked" parts brought to you by chinese vendors that sell aftermarket parts.